Uptown Update: No Thanksgiving Plans? Spend It With Neighbors At Driftwood Bar! No Thanksgiving Plans? Spend It With Neighbors At Driftwood Bar! The details from Rick Heintz from one of our favorite Uptown bars, Driftwood! Details: Everyone is welcome no matter what the circumstances. Turkey and stuffing is provided. Once someone RSVP's to rick.heintz@gmail.com (By 11/21) they will receive a list of sides available to make and can pick their top two. We will try to give everyone their top side dish to prepare but please understand if we can't. If someone prefers not making a side dish or dessert then they may pay a $10 donation to Paws Chicago. 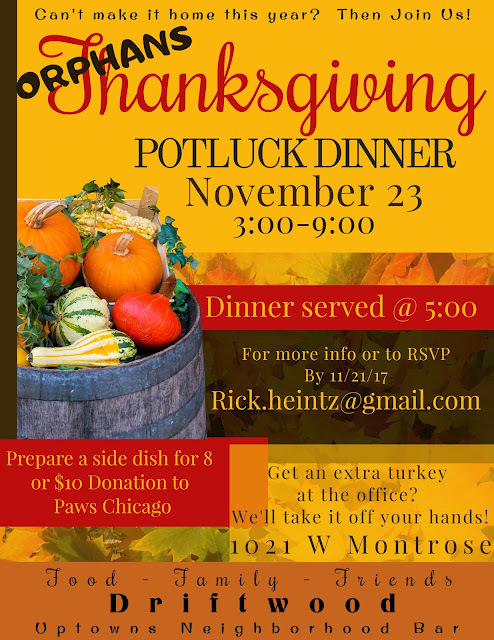 Each person attending must either prepare a side dish or donate. If you can't do either please reach out to me and we can work something out. What an excellent idea! And the money goes to PAWS? Truly wonderful.